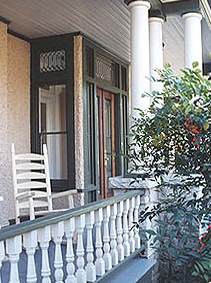 Turn of the Century Bed and Breakfast invites its guests to wander in from the lighted off-street parking and through our leaded bevel glass entry, featuring magnificent copper wheel-engraved double doors. 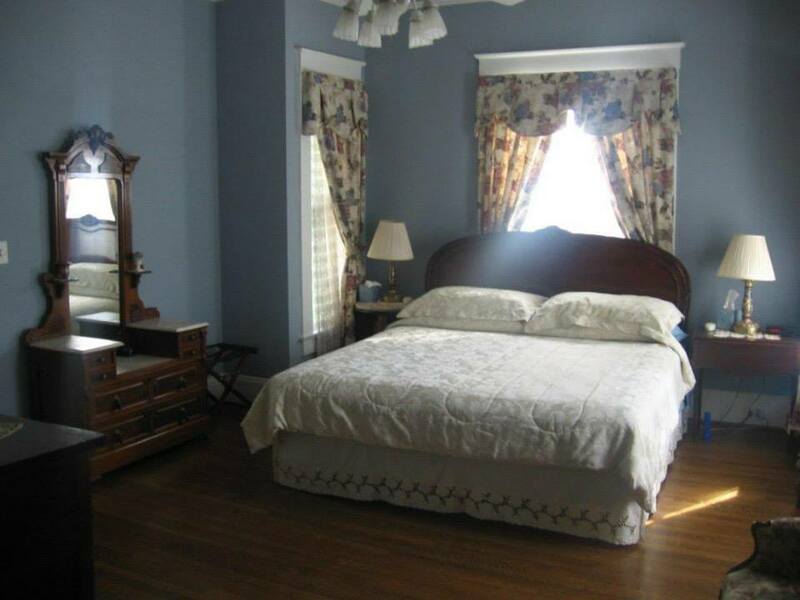 Past our entry you'll discover a inviting foyer and parlor furnished with period antiques. Our bed and breakfast hotel features an inviting fireplace in our parlor, complete with original marble mantelpiece, which is ideal for guests looking for a charming place to relax. The first floor and the second floor seating area in our B&B are made available to all guests, and we thoroughly recommend that you enjoy our complementary wireless internet, books, and board games. Your stay includes a full gourmet breakfast served in our large formal dining room, and you are invited to enjoy coffee or tea on our beautiful wrap-around porch. While we want our customers to be comfortable, we do not allow smoking on the property. 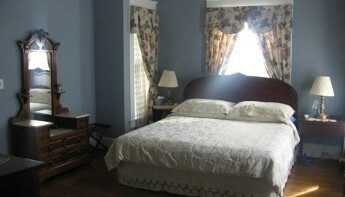 We offer three bedrooms and a single two-room suite. All of these are accessible on our second level, which can be reached by ascending our hand-rebuild stairway that has been architecturally designed to match the style and grace of the rest of our B&B. 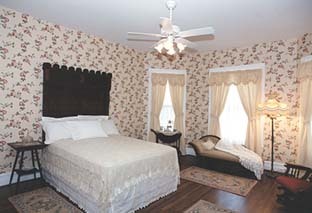 The English Room is named for its marvelous queen size English brass Victorian half tester bed. 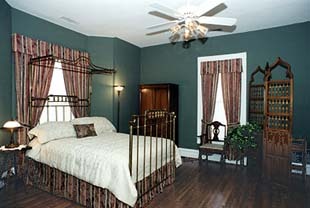 This room in particular has a uniquely European flair, as its sink is set into an antique dresser in the bedroom and its "facilities" were cleverly placed in two former closets during the buildings historic restoration. 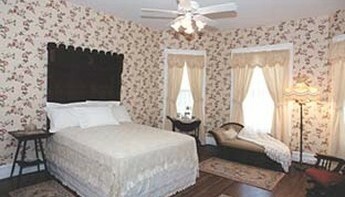 The Rose Room is always warm and inviting, reminding many visitors of their Grandmother's or Aunt's old Victorian home. 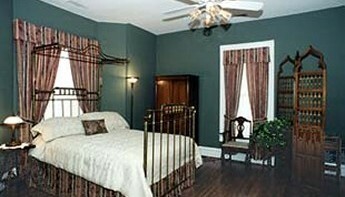 The centerpiece of the room is the ornately carved, seven foot tall walnut headboard that crowns the queen size bed. The bed and matching marble top dresser are the perfect complement to the rooms cabbage rose wallpaper. The walnut armoire and fainting couch add to the luxurious charm of this comforting room. The bathroom is a work of art with tile work from 1928 and unique plumbing in the side wall for the room's cast iron tub. Lastly, porcelain handles on the pedestal sink make the "necessary" room of our Rose Room particularly memorable. The Veranda Room offers a breath of springtime, with its six large lace-covered windows and soft green hues. 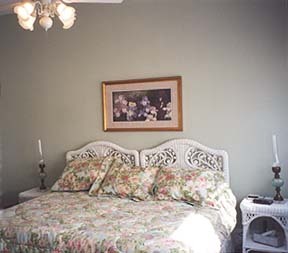 The fresh white wicker furnishings provide a feeling of rustic relaxation, and the furnishings can be arranged as a pair of twin beds or a single king size bed depending upon the needs of its current residents. The spacious "new" bathroom offers a luxurious cast iron claw foot tub that is original to the house, though it has been recently touched up with a lovely glaze of porcelain. The Wedgewood Suite provides a unique private sitting room or office, a spacious bedroom with a single king size carved mahogany bed, and a wonderful 1928 blue and white tile bathroom for which the room was named. The double door suite entry offers flexible access to the private sitting room that contains a television and oak partners desk. Daily rates for the English and Rose rooms are $130 plus tax, the Veranda is $140 plus tax, and the Wedgewood Suite is $165 plus tax. Keep in mind, our rates increase slightly for special events, and minimum stays may be required for special events and holidays. 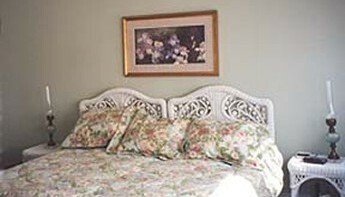 All of the rates are quoted for single or double occupancy, and are always subject to change. Reservations for stays of one to three nights may be secured with a deposit equal to one night's rate. We accept cash, checks or major credit cards. Special events and stays of four or more nights require a deposit equal to half the cost of your total stay. Deposits are refundable with a 10-day cancellation notice for one to three day stays, and a 30-day notice for more extended stays and special events. Due to the historic restoration of the house and the antique furnishings, we cannot accommodate children under 12 years old or pets.